To eliminate contaminations on aluminium disks, silicon wafers and thin glass panels, a new technology for handling without any mechanical contacts is needed. Since the only force that acts on silicon wafers in vacuum is electrostatic force, electrostatic levitation of silicon wafer was examined to achieve levitation of 300 mm wafer. 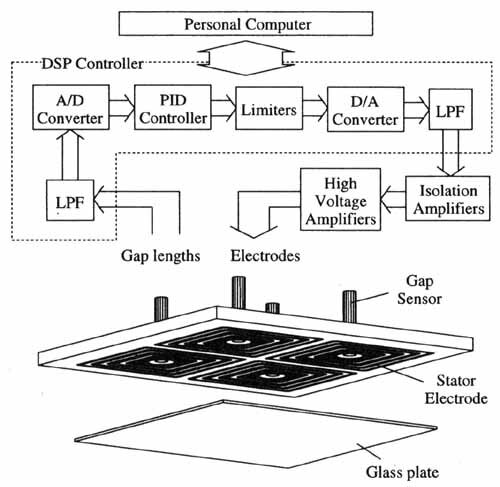 The levitation of thin glass plate was also achieved by inventing the multi-divided electrodes. 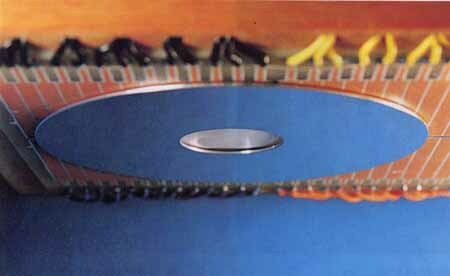 Transportation of the levitated wafer and glass plate could also be succeeded by combining an electrostatic linear drive with this levitation technology. The developed technologies will be utilized in handling system in super clean room and vacuum. As shown in Figure 1 and 2, by controlling the electrode-voltages so that resultant electrostatic force balances the weight of the disk, position and attitude of disks, such as silicon wafers or alminium disks for HDD, can be stabilized without any mechanical contacts. Figure 1: Electrostatic suspension of aluminium disk. View from the bottom. Gap is around 0.4mm. Figure 2: Electrostatic suspension system. By using such a system, a 300-mm silicon wafer also could be suspended with a gap of 0.4 mm. Since silicon wafers are able to be dealt as a conductive material in electrostatic suspension and drive, they can be propelled not by the induction drive but by the variable capacitance drive. A 8-inch wafer could be suspended and transported beneath the electrode plate shown in Figure 3. 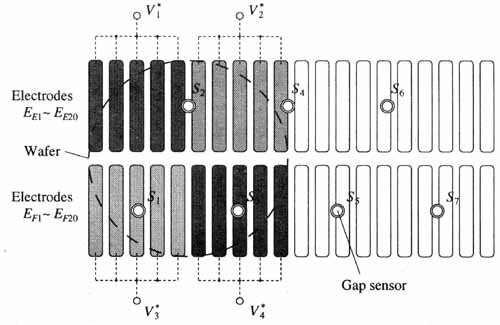 By shifting the activated electrodes and gap sensors in according to the position of the wafer, driving force is generated by the edge effect. 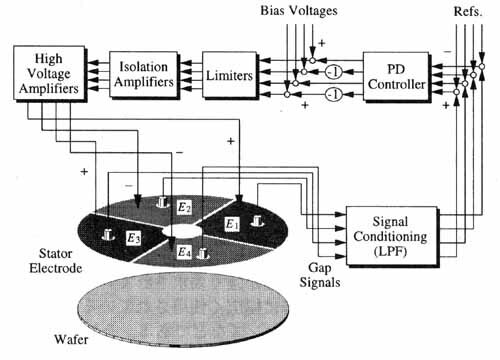 Figure 3: Device for non-contact drive of a wafer. Clean transportation system for a thinner and wider glass plates is demanded in the production of flat-panel displays. 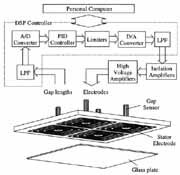 Since glass has high resistivity, we had not expected to levitate a glass plate by electrostatic force without spattering a thin conductive layer on its surface. However, by improving the electrode pattern, we succeeded to directly levitate glass plate. 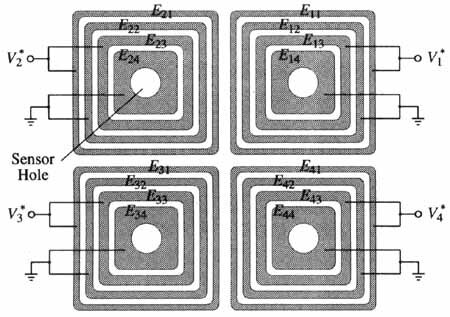 Figure 4 shows one of our impvroved electrode patterns for glass plate suspension. Using the electrode, we succeeded to suspend a flat glass plate of 0.7mm thick. Figure 4: Glass suspension system. With the multi-divided electrode, a glass plate can be lift up immediately after the start of control. As for the drive, glass is very suitable for the electrostatic induction drive. We have already succeeded to suspend and drive a 100 mm x 100 mm glass plate.